You have to see his transformation! 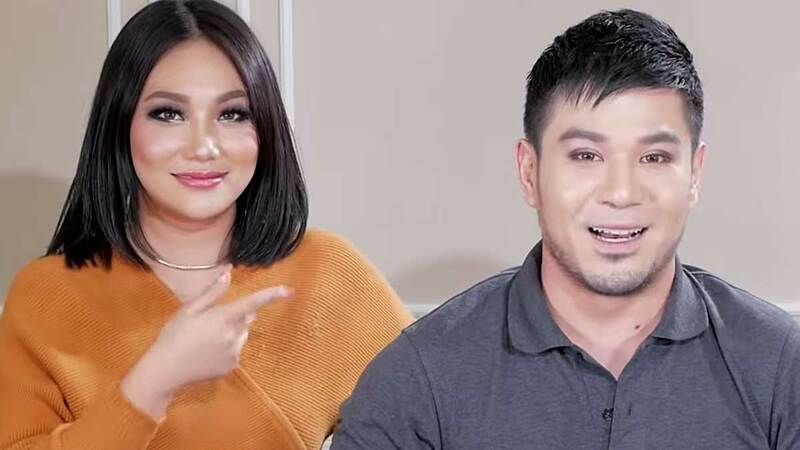 Celebrity makeup artist Albert Kurniawan usually films himself in his YouTube channel doing makeup on different models and celebs. But for his latest video, he's the one who has his makeup done. His special guest, Raiza Contawi, gave him a Korean idol-inspired makeover! (Ed's Note: Over in Raiza's YouTube channel, Albert also gave her a makeover.) Naturally, Albert was nervous because a) he doesn't usually wear makeup; and b) he doesn't know what the finished look will be like on him. She used a lighter foundation shade on Albert's face. Yes, we're generally told to choose foundation and concealer shades that match our actual skin color. But with Koreans, they tend to use one or two shades lighter than their own complexion to give it a brighter (not white) and refreshed appearance. The secret to making it look as natural as it can be, which is what Rai did, is to properly blend everything out until the neck and the ears. She also didn't set it with a powder because Koreans normally wouldn't do that since their weather is colder, and they prefer a glowing finish. Albert revealed he's applied makeup on celebs while they nap/sleep. "Lalo na mga celebrities [because] sometimes you have to shoot from morning to evening or minsan madaling araw. So to [help them get more] sleep or to save time, I retouch [their makeup] while they're sleeping." He also shared how his eyelids naturally developed a fold or crease. Albert has beautiful almond-shaped eyes. When Rai commented on them, Albert said that when he was younger his mother wanted all of them to have a fold or crease on their eyelids. "So yoong ginagawa niya, you know what, from kindergarten hanggang grade six kami, 'pag umuwi from school diretso sa kanya. Kailangan diretso sa kanya dahil [ilalabas] niya yoong tape, didikit niya sa mata namin...So na-develop 'din siya." Albert added later that in this day and age, though, if you have the means and the capabilities, it's better to just get double eyelid surgery. A new Teviant product made an appearance. Albert's makeup line, Teviant, has a new soon-to-be released product: a pencil eyeliner! It's multi-purpose, too! As Albert stated in the video, it can be smudged to work as an eyeshadow. "Its purpose is to apply the eyeliner and smudge it with your finger, so it can become eyeshadow. For summer...kasi di 'ba nahihirapan kayo mag-blend ng eyeshadow niyo sa beach, so you can just use this eyeliner, smudge it, and then you can go." According to our message interview with Albert, the eyeliner will be available on Teviant.com and SM Megamall starting April 27, 2019 for P795. Raiza Contawi Transforms me into a BTS idol!! !